My Madrid and Venom teammate Zak Maytum and I went to the Philippines to do some skating last year. It was the second-craziest skate trip I’ve ever been on (#1 involved lots of drugs and strip clubs). I posted the video a while back, but never got around to the photos, so check it. A fat crew in the jungle, this is what most of our sessions looked like. Dudes were hiking these two or three hairpins in insane heat and humidity. Coming from the east coast, I thought LA was pretty polluted. In Manila, the exhaust and smog is so thick it burns your eyes. I’m terrible with names, but I’ll blame this one on the fact that I visited a foreign country 10 months ago. Railing a righty. The jungle down there is crazy lush and most of the roads we skated were butter smooth asphalt that’d aged perfectly. The roads we skated had some next-level signage going on. Before every turn, there was an easily-visibile sign that told you whether it was a right hairpin, a left-hand chicane, a sweeper, or whatever. We could rage down and corner confidently, even though we’d never skated these roads before. Local libations were key. There are three kinds of beer widely available in the Philippines: San Miguel, Red Horse, and Colt 45. The day we arrived, we got off our 27 hour flight and hung out with the locals for a couple hours before heading out to this rooftop party with skate ramps and DJs. From there, it was on to this insane MMA fight that was sponsored by Colt 45. This was the closest I’ve ever been to being inside an action movie. There were these giant banners that said “The strong beer for REAL MEN.” Dudes were getting kicked in the face and knocked out. Zak and I were two of four white people there, and the other two were not people you’d want anything to do with. We were trying to pound malt liquor to stay awake; but it wasn’t working so we just passed out in the bed of a pickup truck. The pack riding was pretty out of hand; but everyone held it together and there were no major crashes. When you’re bombing down a hill you’ve never skated several thousand miles from home and three hours away from medical attention, it’s usually best to take it easy. You might come around a corner and find some livestock or a rice crop in the road. Check that GoPro stick cam made out of a stick. Tuff. Most of the skaters we met were also into surfing. Jukka, our tour guide, gettin’ some. Buttery toeside with the James Kelly steez. Most of the stuff we skated was around 35mph, which was super sick because we were faster than most other vehicles on the road and could just grip all the corners. 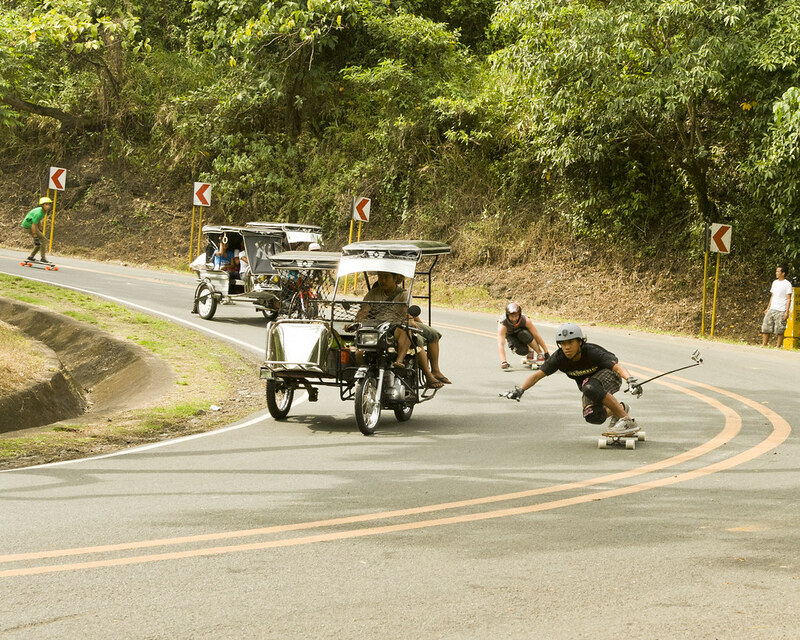 While passing cars is almost always a bad idea because drivers can’t be counted on, the traffic out there is gnarly enough that most Filipino drivers aren’t fazed by some crazy kids on skateboards. They were used to getting passed and knew how to safely give us room, so it was on. There was one really bad close call, but otherwise it was cool. The whole trip was rad. I’d like to go back. Crucial thanks to Excel Figueroa, the rest of the locals, and everyone who let us sleep at their house.